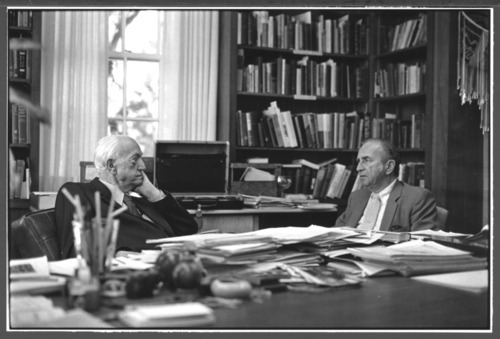 Dr. J. Cotter Hirschberg is shown with Dr. Karl Menninger in Dr. Karl's office at the Menninger Foundation. Dr. Hirschberg joined Menninger in 1952 and served as director of children's services from 1957 to 1970. In 1977, Dr. Hirschberg was presented with the William C. Menninger Professorship. Dr. Menninger is on the left.